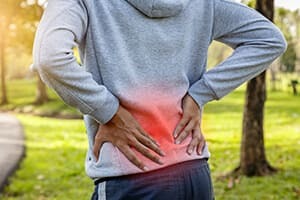 Contact us today if you would like to find out more information on how to relieve your back pain. We will perform a thorough evaluation, review your treatment options and guide you through every step of the way. As the largest joint in the body, your knee absorbs significant stress throughout the day. Knee pain symptoms can vary, but some common manifestations are swelling, stiffness, weakness, popping, grinding, and an inability to walk without pain. There are a wide variety of conditions that result in knee pain. Some common causes of knee pain are trauma from a serious accident (such as a torn meniscus or an ACL tear), repetitive stress, or arthritis. Athletes, people who perform physical labor, obese individuals, and older adults are at increased risk for developing knee pain. Knee pain commonly involves more than just the structures inside the joint. It may include the tendons or ligaments outside of the joint. In order to have complete relief of pain, all of the sources of pain must be treated. If you are tired of living with knee pain after trying other forms of therapy you may be a candidate for one of our advanced regenerative treatments. Contact us today to find out what we can do to alleviate your knee pain, so you can get back to an active, pain-free life! Your shoulder is a highly mobile joint, composed of tendons, ligaments, cartilage, and bones, all of which are prone to injury with activity and sports. 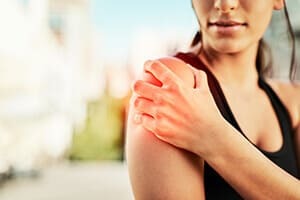 People experiencing shoulder pain may be suffering from a variety of conditions such as bursitis, tendinitis, osteoarthritis, or degenerative arthritis. Shoulder pain can also be caused by sports injuries or other accidents, and those over the age of 50 are especially susceptible to developing rotator cuff tendon tears. Symptoms of shoulder pain can range from mild to severe, and may disturb physical activity and sleep. Pain, weakness, and a loss of range of motion are all symptoms of a shoulder injury. Those who participate in high-risk sports, those whose jobs involve physical labor or older adults are all at a higher risk for a painful shoulder injury. There are many different treatment methods available for shoulder pain, most of which offer helpful yet short-term solutions. If you are looking for a long-term solution that will help heal your shoulder, our regenerative medicine therapies may be the right choice for you. Contact us to schedule your consultation today! Your neck is an important part of your body’s ability to move. The neck protects the nerves that connect to your brain, while also providing mobility and support for your head. Bad posture (i.e. having a constant hunch in the shoulders) can be a cause of chronic neck pain. It’s also not uncommon to begin suffering from consistent headaches or migraines if your neck pain is not properly treated. Symptoms of shooting pain and in some cases numbness and loss of strength in the hands and arms can develop. Neck pain may result from an inflamed nerve, joint arthritis or disc degeneration. Some causes of neck pain include sports injuries, trauma from accidents, poor posture or sleeping in a position that strains the neck. More serious causes of neck pain are osteoarthritis, herniated discs, myelopathy, and stenosis. 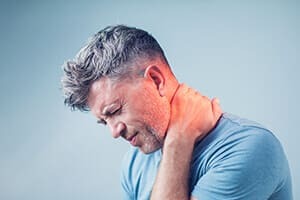 Although many cases of neck pain resolve with a little ice and rest, chronic neck pain is something that needs to be evaluated by a physician. There are natural alternatives that could ease your pain and keep your neck stress-free. If you would like to explore how we help you treat your neck pain, please schedule an appointment.